On February 25, 2019, Euro Jet was privileged to once again participate in the International Operators Conference (IOC) held this year at the Hyatt Regency in San Francisco, California. 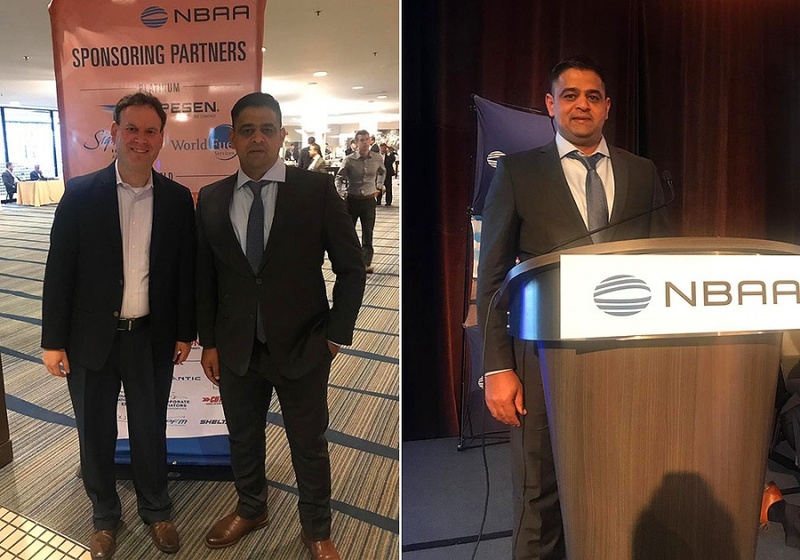 Muhammad Asad, our Business Development and Vendor Relations Manager for Asia and Africa, spoke about a wide array of airports located in 7 countries. Euro Jet was invited by our customer, International Trip Planning Services to speak on their panel entitled “India and the Middle East.” Muhammad was one of four presenters that spoke on the panel. Attended by over 500 pilots, dispatchers, ground handlers, and trip supports, the four-day event is comprised of nonstop presentations ranging from the latest in-flight planning technology, updates on ground handlers from around-the-world, new FAA/EASA and other country regulations, and even a discussion about pilot fatigue and ways to prevent it. Muhammad’s speech was not the first time Euro Jet had spoken at this event. In fact, this was the fourth time year Euro Jet has spoken out of the last six IOCs. Not a bad track record; it is nice to see that they keep inviting us back! So how does this happen? How much preparation is involved? Here is an “insiders” look at how this happens, and some insight into the planning that goes on. Every Summer, the IOC Committee meets (usually in the location where the next conference is being held) and at this meeting they give out panel assignments to different trip support companies. Once this happens, I then pitch to different panel representatives’ different topics that Euro Jet can speak on. The first time we spoke was on the Jeppesen panel back in Tampa, Florida where we came up with the idea of looking at all CIS countries more in depth. Up until that point, CIS countries had not really been covered at the IOC. When we spoke two years later in San Diego, we were on the panel for Europe and spoke about the Balkan countries, another subject that has never been covered. Last year in Las Vegas, our colleague Paul Lourenco spoke again about the Stan Countries and also Russia. Like any good sales person, we have to figure out the right person to speak to and then offer them something unique that others cannot do. Once a presentation is accepted, we essentially need to know two things: The first is of course the locations, though perhaps even more important is the time allotted. Presentations need to provide a lot of data and information and time is very limited. For this last presentation we had 20 minutes to discuss the following countries: India, Pakistan, Afghanistan, Kuwait, Qatar, Oman, Dubai, and Abu Dhabi. To make matters more complicated, we decided to really focus on Pakistan as this country has really never been properly covered at the IOC. Once again, we are focused on offering something unique and teaching the audience something that is new. In order to prepare for this, Muhammad had to fully research each airport and provide me with an immense amount of data. I then take all this data and start putting together a presentation. We also work with our colleague Kamil Rechtorik in Marketing who designs all the maps, diagrams, and various other graphics that we use throughout the presentation. Some of the data involved unusual flight level restrictions over Afghanistan, figuring out anything about the 2022 FIFA World Cup in Doha, and learning about the history of Pakistan and its current security situation. We even touched a little on donkey hospital’s in Pakistan…that can be a topic for a future blog. As the presentation comes together, Muhammad and I start talking daily for about an hour figuring out what works, what does not. After about 2 weeks of these calls we have created the first draft presentation (ultimately, we would go through 18 drafts before the final one). For the next 4–6 weeks we will then practice, practice, practice every day – with a stopwatch in hand! When you have an audience of 500 plus people staring you down, you need to be prepared. And not a second can be spared as the IOC runs on a very tight schedule. Perhaps the biggest challenge is keeping it interesting. It always helps to have a few jokes thrown in. Admittedly, I was flattered when someone who attended our presentation six years ago was able to recall one of the jokes. In the end, once we have exhausted all rehearsals to death, it is time for the Euro Jet employee to perform – in this case Muhammad. Let me emphasize that it is NOT EASY to get in front of 500 plus people, especially so many pilots! Fortunately, Muhammad performed; he demonstrated how months of preparation can successfully come together in 20 minutes. And most importantly, we hope our discussion of Pakistan, India, and the Middle East shed some new insight that others may not have known before as we are there to educate the audience about new regions. Our goal is that they will walk away with some new knowledge about the region. And if we get lucky, six years from now one of them may even remember one of our jokes!